…you don’t want them scratching on the furniture and drapes, do you? Why not get them their very own scratching post? While the shape, size and design of our scratching posts varies, the big brands we carry remain the same. We’ve got scratching posts from Aristocat – durable designs from 2-8 ft tall. 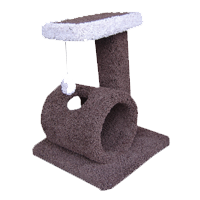 These scratching posts are made from recycled material, and many even have an attached mouse for added amusement! We all know cats love to claw and climb. Unless you are one of the few with a tree situated in your house, most likely your furniture is the next best thing. Why not gain your cats attention and love with an Aristocat scratching post Saving years on your furniture, equals money in your pocket. Use high grade SHAW carpet on ALL our products. Did you know that all of Aristocats new materials were destined for the landfill After years of extensive research we’ve been able to find wood and carpet trimmings that would have otherwise gone into the trash. We bring products from all over north America to our factory so they can go to good use.